The 5th Wave by Rick Yancey (G. P. Putnam’s Sons). 457 pages. I try to always learn something new whenever I read a book. The biggest lesson I learned in reading The 5th Wave is that a big-name publisher and lots of awards and positive reviews on the back cover does not necessarily guarantee a great book. I had heard about The 5th Wave for a while, both on Goodreads and here and there. When my wife and I visited a Barnes and Nobles a few weeks back, I saw it featured and picked it up. I read the first few chapters and was hooked. The story is one of alien invasion; the big twist is that you never see the aliens, only their ship flying overhead. The book talks about attacks on the earth happening in waves. The first wave is an electromagnetic pulse that shuts down all electronic devices, including our entire military, power and transportation. The second wave is a kinetic bomb that results in a tidal wave that destroys those living near the ocean. And so it goes. The aliens continue to attack in waves until by the fourth wave there are few people alive in the world, most of them resorting to living in the wild, constantly looking over their shoulders for the next attack. But that’s where it falls short. Yancey sets everything up well with plotting and characterization that I can buy into, but then falls into the formulaic approach to writing a YA novel. There’s the boy who got away. And then there’s the second boy, eventually turning it into somewhat of a love triangle. 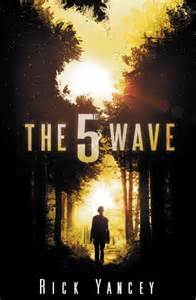 When he gets to the point of revealing the 5th Wave (which I won’t do here), I had already figured out what it was. And so there was somewhat of a letdown for me. And of course, there has to be a big explosion at the end, setting it up for the inevitable Hollywood blockbuster. The story is entertaining, I will give him that. But after such a good premise and a good beginning, I found it slowing down in the middle and disappointing in the end. I wish YA didn’t have to have the love triangle. It ruins the stories I think. Not every girl’s dream is to fall in love. Great review and it made me want to read it just to see what the hype was all about. Sorry it was such a disappointment.